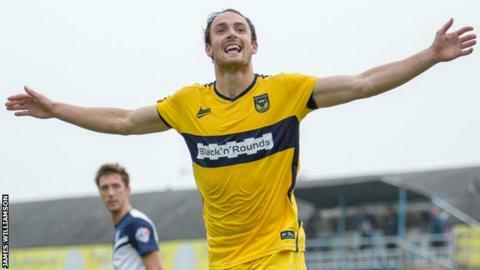 Danny Hylton has scored 16 goals for Oxford United this season. Oxford United striker Danny Hylton says a mid-table finish or lower next season will not be acceptable for the League Two club. "We know that, the gaffer knows that and we want to achieve something next season," Hylton told BBC Radio Oxford. "I don't think mid-table will be good enough. We want to be right up there." The 26-year-old arrived at the club last summer and has scored 16 goals in 48 appearances. As well as winning the club's golden boot, his performances led to him being named supporters and players' player of the year at the end of season awards. And despite a season of underachievement, he believes Oxford are ending the season in a positive manner. "When I joined I had visions that we would be up there and challenging, but it wasn't to be," he said. "A little while ago everyone was talking about relegation and it was doom and gloom, but there is a much better feel about the place. "Our finish has showed we can achieve good things next season. The gaffer showed us a few bits and bobs that will be going on next season and the season after and it's exciting times and I'm sure with the players we have there will be." Hylton, who began his career at Aldershot, also hailed the team spirit among the players. "We work hard, we might have a moan up at each other and might dig someone out one day," he added. "We are all tight knit, sit down have a cuddle and a cup of tea after training."